FAMILY DAY OUT IN DEVON – SEA KAYAKING FUN WITH THE KIDS! Sea kayaking makes for the most perfect family trip! We’ll go on a mini expedition ducking in and out of hidden lagoons and picnicking on secluded golden sand beaches. Watch their delight as they discover the wonders of this unspoilt coast and get up close to the wildlife! Our instructors have boundless enthusiasm and they are all brilliant with kids so there won’t be a moment that isn’t packed full of fun! You’ll get to find hidden shipwrecks, jump off rocks into the sea. You can explore places only accessible by kayak, like into spooky sea caves and through a hidden tunnel that leads to secret lagoon. In out lobster pots we catch and learn about amazing sea creatures like crabs, mini sharks (dog fish), lobsters and if you’re lucky we sometimes even catch an octopus! We’re very gentle with all the animals we find and after you’ve had a good look most things go back in the water. We have a selection of smaller kayaks for your children and if they get tired on the way back our instructors are delighted to give them a helping tow. Younger kids can still join in the fun by sitting in the front of one of our big stable double kayaks which they can share with an adult. We have a selection of ‘mini kit’ especially for kids, including specialist kayak life jackets designed for young children. 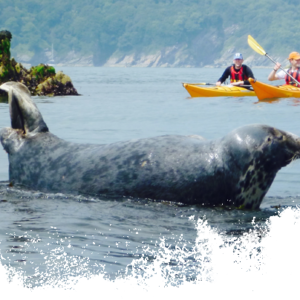 With stunning scenery and endless exciting places to explore Dartmouth is one of the best places to Sea Kayak anywhere in the UK. The famous Dart estuary with it’s steep valley sides lined with ancient Oak forests, provides us with calm sheltered kayaking. Out along the coast there are lots of sheltered bays and inlets so you can have a fun but also relaxing time. Kids as young as 5 are very welcome and we have taken even younger kids out on the water, please give us a call if you’re unsure if your children are old enough. Nobody is too old to kayak and so please do bring granny and grandad! Young kids, teenagers, parents and grandparents can all go out together and all of you will have a fantastic time! PLEASE BOOK ABOVE, CALL OR EMAIL TO BOOK YOUR TRIP!